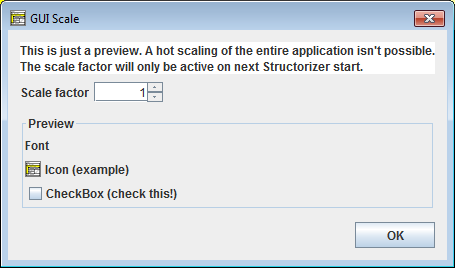 Structorizer is not DPI-aware, i.e. it will not automatically magnify its icons and fonts with very high screen resolutions (like e.g. 4K). This ought to be done by the GUI framework, actually, but JavaSwing fails to do so. A complete GUI redesign using e.g. JavaFX instead might overcome the problem in the future. But for now only a makeshift workaround based on a scaling factor inserted in the preferences file can be offered. 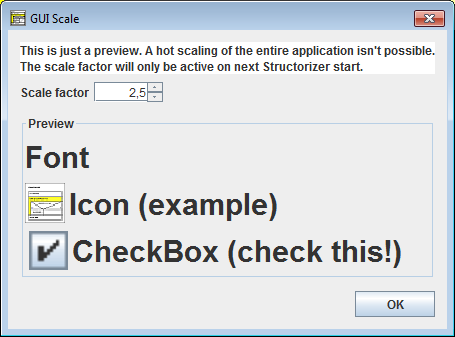 the selected Structorizer Look & Feel. With certain Look & Feel / OS combinations, some of the fonts might resist the scaling attempt. In other environments, the scaling may differ among various controls or it may even be unstable (such that e.g. certain tab or sub menu captions switch their font size on being selected). Title bars would usually not be affected (as their appearance is controlled by the OS), whereas checkboxes at menu items might remain in tiny (i.e. standard) size despite of the magnification of their corresponding captions. Or the checkbox might not properly react to the user activity (some Look & Feel might e.g. show the box checked while and whenever the cursor is hovering over it). The scaling consistency has been improved substantially between Release 3.36 and version 3.26-01, though in upscaled mode some L&F-specific effects (e.g. "mouse over" shading) may still get simplified or even lost. So, don't expect too much, please. You might have to experiment a little in order to find out which Look & Feel (and what scale factor) works best for your purposes, machine, and taste. 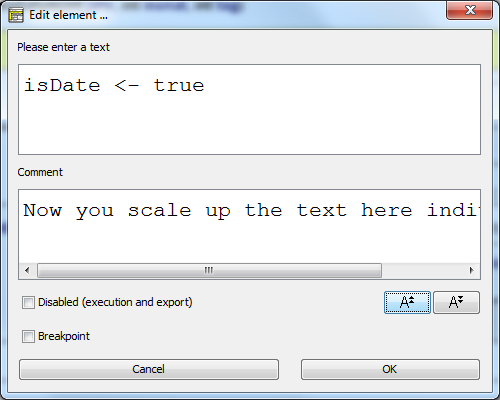 This enhancement had to be introduced because on some systems the fonts for these text fields cannot be controlled by the general scaling factor.